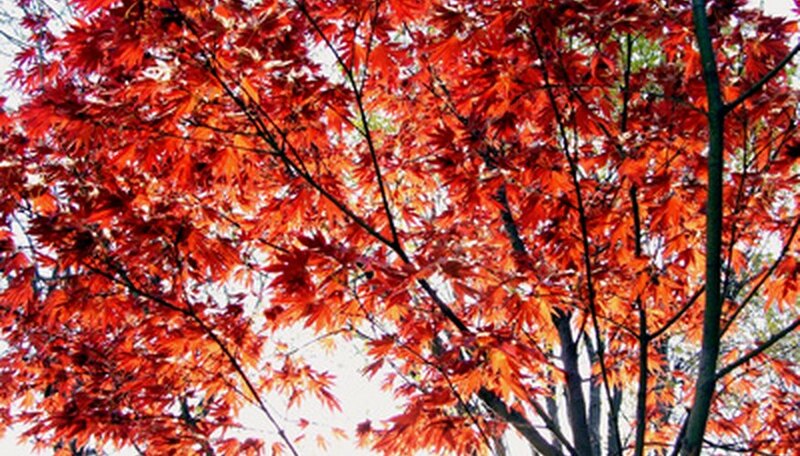 The red maple is one tree that doesn't wait until fall to show off its stunning red leaves. The profusion of small red flowers on a maple tree is one of the early signs that spring has arrived. Contrasted with the tree’s smooth, gray bark, the bright red flowers make it a striking addition to a landscape. Wildlife, as well as humans, benefit from red maple trees. The fruit of the tree, known as a samara, provides an essential wildlife food at a time when other foods are usually unavailable. The red maple tree, also called scarlet maple or swamp maple, belongs to the Aceraceae family. This tree, which is deciduous, meaning it sheds its leaves annually, has red flowers, hence its name. Although the red maple is known for its scarlet foliage, leaf colors in autumn can also range from bright red to yellow or greenish-yellow. Some of the most popular trees include the summer red maple, scarlet red maple and Japanese red maple. The summer red maple is known for displaying its fall colors earlier than other maples and continues to show brilliant colors for months instead of weeks. The scarlet red maple has dense branches and is usually used as a property shade tree and for lining sidewalks or driveways. The Japanese red maple is a popular ornamental plant with reddish-purple leaves in both spring and fall. Red maples are tall trees, growing between 40 and 60 feet, according to Tree Help.com. When the tree is young, it’s shaped somewhat like a pyramid, but then later develops more of a rounded to oval shape as it matures. These trees can live up to 200 years. Red maple trees are usually found throughout the eastern United States and southeastern Canada. They range from the southeastern areas of Manitoba, Canada east to Newfoundland and then south to Florida and as far west as eastern Texas. While red maple trees generally grow in river flood plains or low wetlands in northern states, they’re found more in drier areas on higher elevations in southern states. In addition to being a showy ornamental tree, red maples also furnish shade. Red maples thrive under a wide range of soil types and locations. According to Mass Maple.org, there probably isn’t another forest tree species able to do as well in such a variation of environments. Another benefit of red maples is that the tree's sap yields good-quality maple syrup. Red maples are also able to tolerate shade. Its wood is used for making inexpensive furniture such as crates, baskets, railroad ties and mine props. Although these trees can withstand a wide range of soils, they can’t tolerate soils with a considerably high pH. They’re also intolerant of salt and need partial shade to full sun. Regardless of how beautiful red maples look, they should never be planted near horses as the leaves can cause a horse digestive distress or even be fatal. The leaves contain a substance capable of causing a breakdown in a horse's red blood cells, causing serious problems. What Maple Trees Are Toxic?